Leather belt clip holster case with accent striping gives you style and functionality all in one. For ladies, customize this case with a hand strap or carrying strap and make it a phone purse on the go! Using the finest workmanship, our team of leather artisan beautifully crafts and tailors the case to fit regardless of your device's make/model and size. My daughter ordered my phone case as my birthday present. I am very pleased with it. 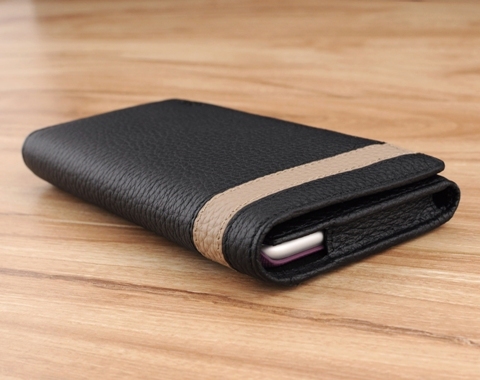 Workmanship is outstanding leather is beautiful fits my phone which is in a third party protective case perfect. Our specifications on the order were followed perfectly. A beautiful product I am proud to wear and share with my friends. I would like to see any other items you offer. I was really happy to receive such a high quality product. The workmanship is perfect and the delivery very quick. Thank you for an awesome product! I ordered my case customized my own colors and style within time allocated I received my new Murano case all I can say is perfect fit, perfect function so far it has exceeded my expectations and the look and feel of it has had all those who have seen it saying they really like it and wishing it were theirs !! Thanks StoryLeather Excellent product!!!! Only case I could find to fit my IPhone 6 with Survivor cover. Excellent quality and manf. driven to make sure it fit properly! I was a little put off by the price and wait time, but when I received the Murano custom made to fit my iPhone 6 Plus and my favorite Disney protective case I was convinced it was worth every bit of the time and money. 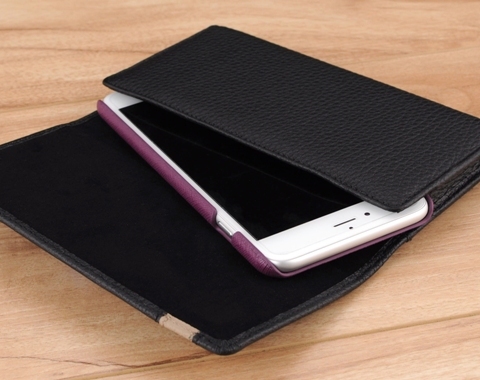 The Murano is very well made out of excellent leather and fits my iPhone 6 Plus perfectly. The case and cover are deep enough there is no danger of the phone falling out but it slips out easily when needed. My wife often grumbles about anything hanging on my belt but the Murano is so unobtrusive she didn't even notice it for a couple of days and then commented on how "handsome" it is. Now I know what to get her for her birthday. I have now ordered 4 of Story Leather iPhone Cases. My first leather Holster Case was for the iPhone 5s, but with the new firmware update I had to update my iPhones to the 6s which meant a larger cases. Since I have two iPhones that meant two customized cases, but in the meantime so I would have a quality case, I ordered the In Stock iPhone 6s Case until the customized case was completed. Even though I have a thin bumper, the iPhone fits okay. As I am using this temporary case I am finding the leather is relaxing and the iPhone is sliding in and out of the case much easier. It is a shame to dispose of the previous case for the iPhone 5s since I have used it for almost one year and it is still in excellent condition. Therefore, I am totally sold on the quality of Story Leather total leather cases, both inside and out, plus I like have the Holster loops with the clip for extra protection. Quality of my iPhone 6 case is superb! I'm completely satisfied with the craftsmanship and material quality. Like the saying goes....You don't always get what you pay for...but you typically pay for what you get...no free lunch. Worth every penny! Excellent phone case! I did a lot of research in looking for a quality leather holster for my 6 plus iphone. I have my phone encased in an Otter Defender for protection and this became problematic in searching. Most websites I searched had holsters, but the sizes would not accomodate the addition of the Otter Defender. I came accross Story Leather who makes custom-made holsters. I provided all the details of what I wished and included measurements which I added an extra few millimeters to ensure ease of putting in and taking out of the holster. I actually received a call from Story Leather to discuss my sizing. I was informed that production using their process should meet my need. I have to say the holster is exquisitely done and far exceeded my expectations. Yes it was a bit pricey and I had to wait a month for production, but it was definitely worth the money and time. It is serving me well and can tell from the craftsmanship that it will last a lifetime. I am so glad to have found Story Leather and would highly recommend them to anyone looking for a quality made product. The phone pouched I ordered from Story Leather arrived in a few weeks and I could be happier. The quality of the leather, the quality of the craftsmanship, the precision of the construction is second to none. It fits my phone in its case perfectly! I spent $50 trying other cell phone pouches from several manufacturers before coming here, I'll never do that again! I'll come here first! I am very impressed with the quality and craftsmanship that Story Leather puts into their products. The website is excellent, allowing you to design exactly what you want, with an impressive variety of materials. They are very conscientious about ensuring that you receive exactly what you want. The pricing is reasonable (cheap actually) when considering that the products are custom made to your specifications. I recommend this company to anyone who wants quality products. Wait time was a little long but it was worth it. It's a beautiful case and fits my phone perfectly. I recently upgraded to a Galaxy Note 5 and was not happy with available holsters. 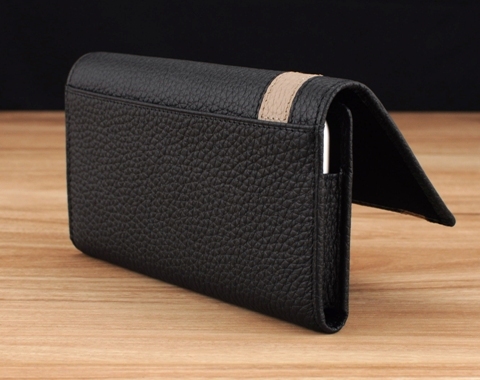 I came across Story Leather products and will never purchase a phone case from any other site. I was able to custom order a leather case that perfectly fits my phone and the quality of the craftsmanship is unbelievable. Thank you Story Leather! I have purchased 3 custom cell phone holsters that I designed from their website and have had excellent communication with Jerry at Story Leather and his staff. They even caught a measurement mistake that I provided and notified me of it before incorporating the mistake in the product. I have referred many people to Story Leather and have nothing but high praise for the quality of their products, their work and communication throughout the process. This case met all of my expectations. Ordering process couldn't have been easier. You can literally customize ANY aspect or feature of ANY model case, holster, or cover they offer. If there's an option that's not listed in Story Leather's choices, contact them and they can accomodate your wishes. Try that with eBay! The Murano holster and matching iPhone 6+ cover I received were beautifully crafted. The attention to detail; stitching, color accuracy with web site choices, construction, and ultimately, presentation, were in line with any of the finer European or South American offerings. Treat yourself, and your $800.00 phone, to a piece of craftsmanship you simply don't see with the usual mass-produced flotsam available. I was very impressed with this company and the quality of the phone case I bought. The customer service was very kind and they kept me informed on the mailing status. It was a long month till I received it but well with the wait. Highly recommend this company. This is my first experience with Story Leather and certainly not the last. I spent a lot of time looking for an appropriate case for my iPhone 6 and really found this website by chance. Looks a lot like the case I had for my iPhone 4S which I loved, but a much better crafted product. Serendipitous! Let me tell you a Story. As my Note 3/UAG-encased phone wore its way through a second holster from an "online shoppe" I use for buying cat litter...it was time to look for a place that can build what you need in a holster case. My wife found your website, and I must say the product we ultimately received was equally matched by the simple presentation and quality of your storefront. We plugged in my phone's parameters, easy to do, and the choices were plenty. I really like the hole in the bottom to push the phone out, and the half-moon shaped cut out on top to grip the phone quickly. I used to struggle with those other holsters, but this one is so easy I see why custom made was the better choice. Even small details, though I do not know if they are done on purpose, shine through. For example, If I slide the phone faced inwardly I can check messages privately, but the side of the phone holster does not cover the bottom-firing speaker and, making it perfectly placed for hearing notifications. On the "flip-side", when I want to listen to headphones, I can turn the phone face out (the phone has Panzer glass) and now the headphone jack is revealed on the other side of the holster, with the volume rockers exposed on top. As this was a first-time order, we did call customer service. You want to know who you are dealing with. I should not have worried. The representative was easy to talk with, understood the differences in their product lines, and, unprompted, even confirmed that my configuration was going to be easy to live with on a phablet-sized device. Further, they are Military Friendly. Thank you for a great product of Leather! Love the case you made for me - when new phone comes out in April - will definitely order a case to fit new cell. My grandfather would be impressed, because he made his living as a Leathersmith. The innovation of the custom made ingenuity and forward thinking of the design! He also would be impressed by the value $99.00 cheap when you think what people would pay for plastic or fake leather! I ordered this case with allowances for the iPhone protective case. It has a perfect fit, and is easy to remove the phone and re-insert. I plan on purchasing any future cases from StoryLeather. The case met all of my expectations and you were right about the size. This is by far the nicest and best made case. I will show it to family and friends, hopefully you will get some orders. This has been by far the best cell phone case I have bought. Exceptional quality and craftsmanship. Will definitely consider future purchases with Story Leather. Well worth the months wait it took from the time the order was placed to when I received it. Thanks guys you all do a very well job from the people who make the cases to customer service. This product is perfect. Love it. It fits the cellphone perfectly and hangs from my belt just right and is very functional. The detail and quality of work is fantastic. Also the materials are of high quality. I would highly recommend this case. I have looked for a brown holster for my phone and have never found one that is real leather and quality made. I was blessed to have found Story Leather. I custom ordered my Ostrich skin leather holster and it is even better than anticipated. I have recommended Story Leather to all of my friends. The MURANO model for iPhone X can it be made without a bely clip? Yes, if you go through the custom design process, you will come to a step that allows you to choose a back style, you have the option of choosing a belt clip, a belt loop, or have nothing added to the back side of the case. Can I have two belt loops to the back side of this case for added security? Although this is not an option in the customization process, we do get this request from time to time, and we will gladly accommodate this. Please kindly note this in the Special Request section and we will gladly built it on request. 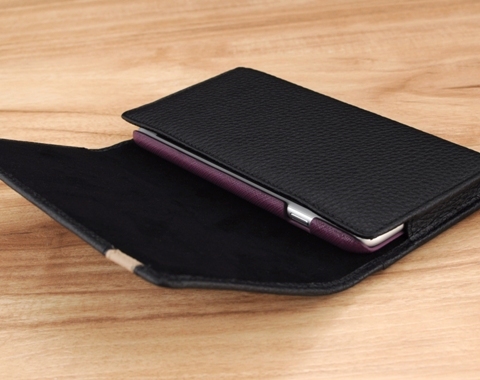 Can I make this case to hold my iPad Mini? Can I pay extra to get this case made quicker? Product lead time for all custom orders is 25-30 days. We want to be fair to all of our customers, so we do not offer "expedited production" service. We understand it's a long wait, but we are sure you will be pleasantly pleased with your custom case upon receipt. I have an Otterbox with my iPhone, will this case fit? YES. Since the case is custom made to order, we will tailor the case to fit. As you go through the customization process, you will choose that you using a 3rd party case and kindly provide the dimensions for your device. Be as precise as possible when measuring to ensure proper fitting of the case. Can I buy this case in a different color? YES, click on the button above labeled "CLICK HERE TO BEGIN" and you will be able to choose your choice of leather color and texture.